We had an exciting challenge last week, framing up an Asian scarf for one of our clients. Our client did not want it framed with mounts and under glass, but instead, left open so that the detail and texture could easily be seen. We decided to wrap a piece of suitable black material over stretcher bars, like a canvas wrap and then hand sew the fabric onto the material. 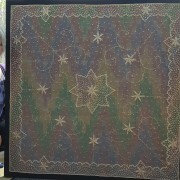 The overall result created a beautiful piece of artwork, with the black backing material setting off the fabric perfectly. Maybe you have something similar from your travels which needs framing? Let us turn your memories into works of art.